While October 5, 2009 may have seemed like an ordinary day for most, for James Moultrie, that day changed everything. On that Monday James walked into Rogers Towers, reporting for his first day of work as the Office Services Assistant. At 20 years old, James was shy, living with his mother and riding the bus to work. Today, James is an outgoing, confident, seasoned employee of the firm, living independently in his own place and driving to work. For James, October 5, 2009 will always be a symbolic day, something special. James had just beaten the odds. When individuals with disabilities are given an opportunity, great things can happen. 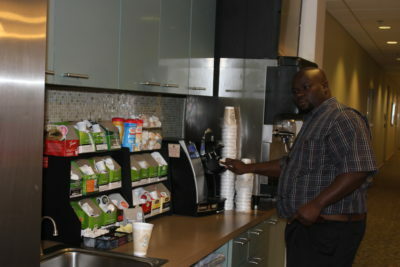 James is a full-time employee, responsible for stocking all the coffee and soda stations, refilling all the paper goods, making sure the conference rooms are always ready for the next meeting and collecting recycling from all three floors of their firm. 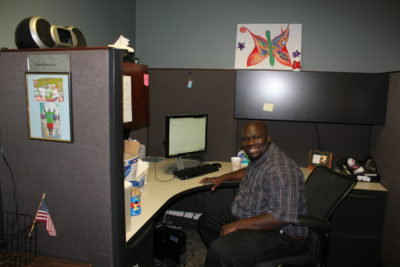 When he first started, his job coach through The Arc Jacksonville assisted him with learning his new job responsibilities. Through hard work, determination and the natural support that James receives from his co-workers, he no longer needs the assistance of a job coach. 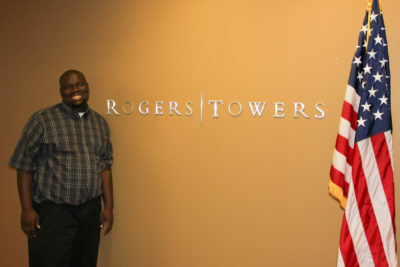 Rogers Towers is one of Florida’s largest and oldest law firms, with more than 70 attorneys practicing statewide. Their law firm — and attorneys — has been recognized in state and national publications for industry experience, most recently by Florida Super Lawyers Magazine and The Best Lawyers in America referral guide. Rogers Towers is proud to offer the full range of legal services in a variety of practice areas, including commercial litigation, family law, labor and employment, real estate, trusts and estates, wills and more. The Arc Jacksonville applauds Rogers Towers for sharing in its vision of a community where disability is a distinction without difference. Interested in employment opportunities for your company? Contact Susan Hamilton at 904-355-0155 or visit our Community Employment page.